Abobotulinumtoxin A Injection (Dysport) is used to treat severe spasm in the neck muscles or cervical dystonia. It is also used to treat muscle spasms at the lower limbs (toes, ankles) or at the upper limbs (finger, wrists, elbows). Abobotulinumtoxin A Injection (Dysport) or also called as botulinum toxin type A. it is made from the bacteria that causes botulism. Why use Abobotulinumtoxin A Injection (Dysport)? Abobotulinumtoxin A Injection (Dysport) contains botulinum toxins that block nerve activity in the muscles. It causes a temporary reduction in muscle activity. This is also used to temporarily decrease the appearance of facial wrinkles. This medication is approved by the Food and Drug Administration (FDA). How does Abobotulinumtoxin A Injection (Dysport) work? Abobotulinumtoxin A Injection (Dysport) is an injection for wrinkle cure. This non-invasive method in the meantime is lessening the muscle movement in the target areas. It softens the look of glabellar lines. The vertical lines that are noticeable on your forehead in the middle of your eyebrows are called glabellar lines. How to use Abobotulinumtoxin A Injection (Dysport)? 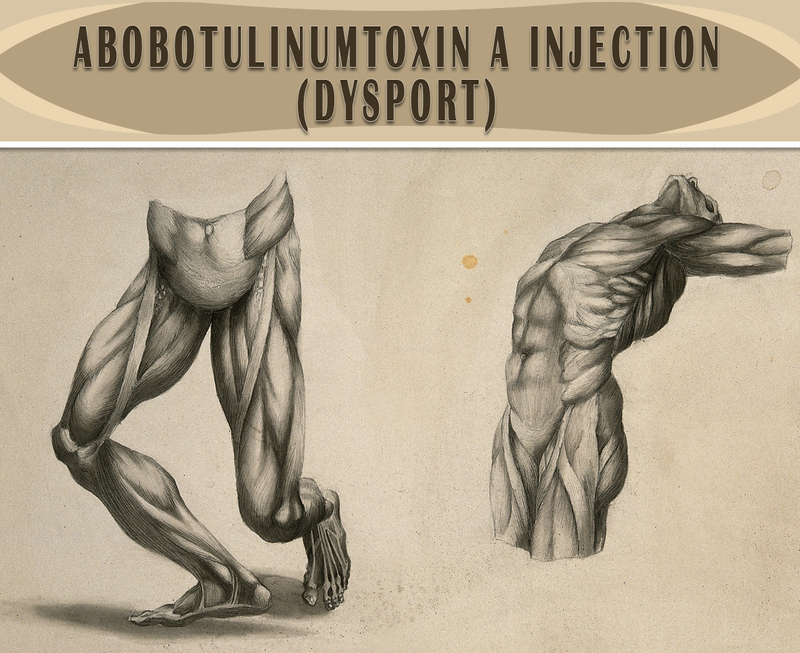 Abobotulinumtoxin A Injection (Dysport) is injected into a muscle. Do not use it alone. A doctor or nurse will give you this injection. This should be spaced 3 months apart. Your injection may be given into more than one area at a time. It depends on the condition being treated. What are the side-effects of Abobotulinumtoxin A Injection (Dysport)? Consult your doctor first if you are pregnant, breastfeeding or elderly before using this treatment. Stop using this if there is an allergic reaction. Do not use this if you have a skin infection at the injection site. Inform your doctor about the medical history that you had or if you any present medications. Patients with bleeding disorders may experience bleeding at the injection site.